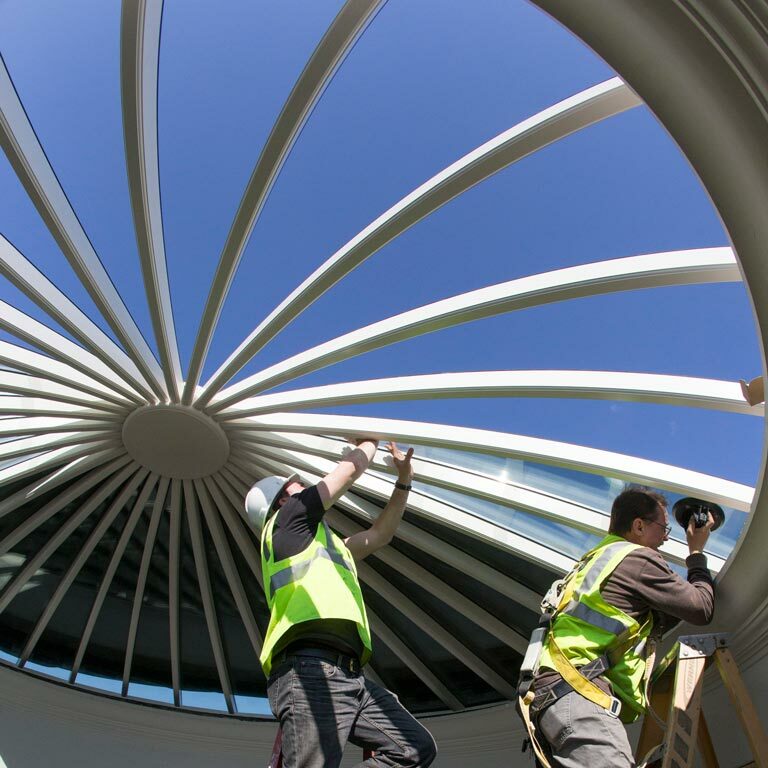 After more than four years and about $58 million of repairs and restoration work, the Rotunda will appear to the naked eye much as it did before renovations began. But change it has. 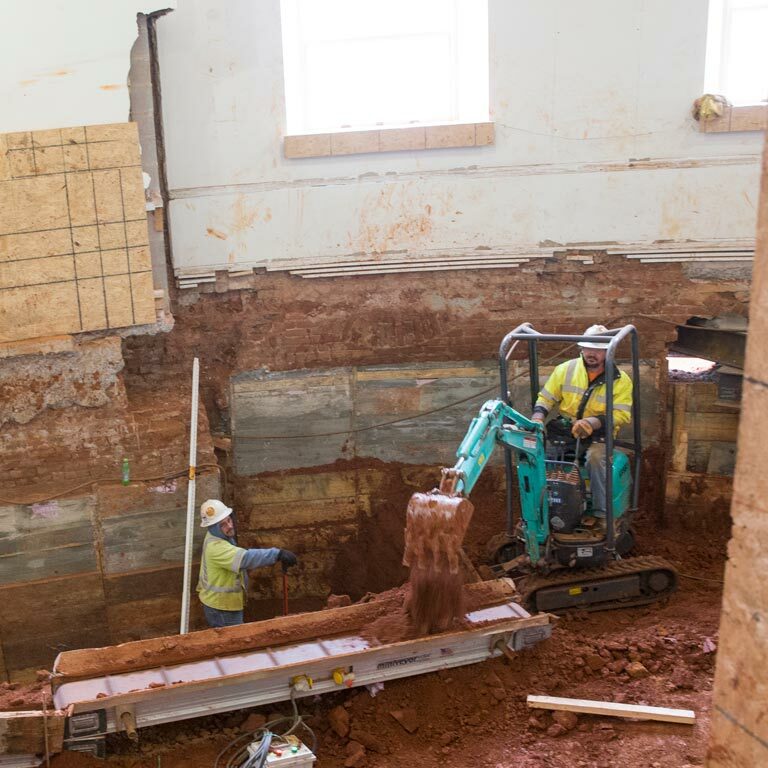 Thousands of hours of work went into repairing the leaky roof, stabilizing the building and marrying Jefferson’s original designs (and some of Stanford White’s) with modern building technology. 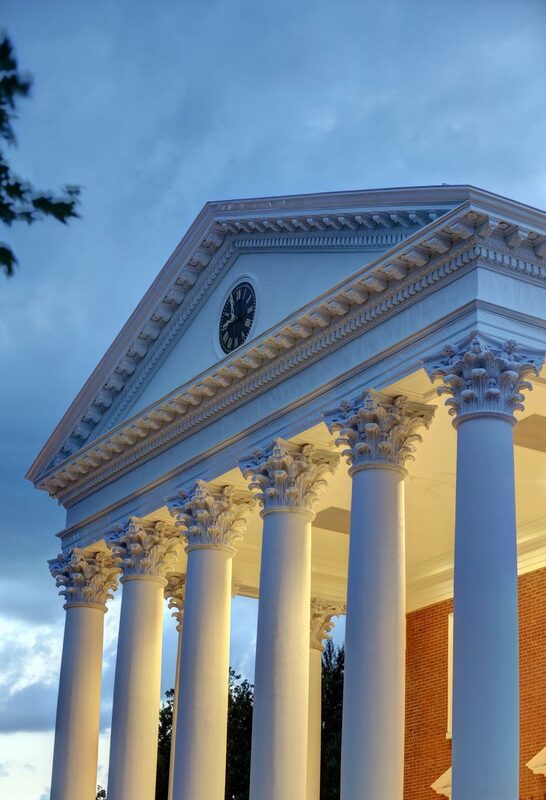 What’s more, UVA’s preservationists didn’t just want to restore the building; they wanted to bring it back to life. 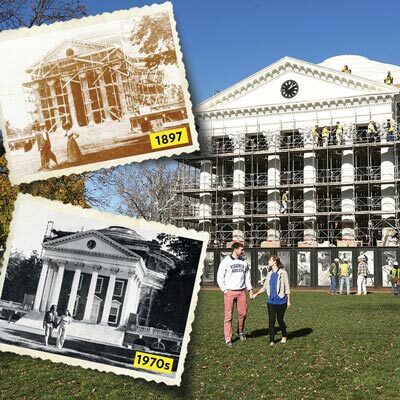 “I think it’s a sin that there are people who have graduated from the University in the last 70, 80 years, who have never set foot in the building,” says historical preservation architect Jody Lahendro (Arch ’82). 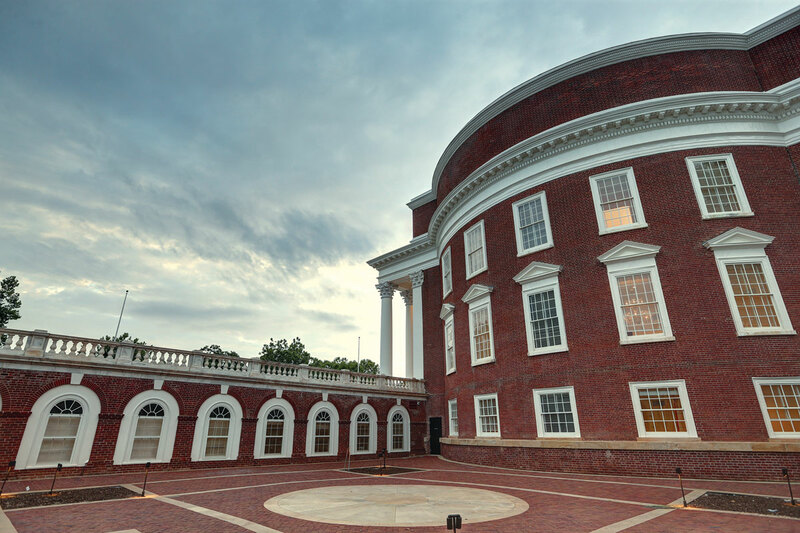 Jefferson designed the building as a functional academic space—it was a library, not a museum—so increasing the building’s usability was the thing most dear to the design team, Lahendro says. Crews enhanced the building’s power, wireless internet and cell data resources. They added televisions on wheels and digital projectors, reclaimed office spaces as classrooms and placed plush furniture in the Dome Room balcony. Students will be able to study here well into the evening, and they can sip coffee while doing so. 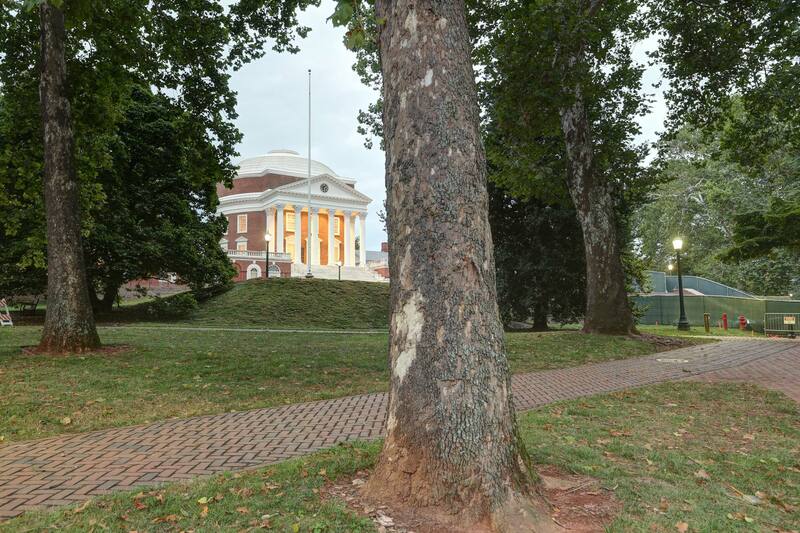 What follows is a look at how the Rotunda is now a building fit for a 21st-century university. 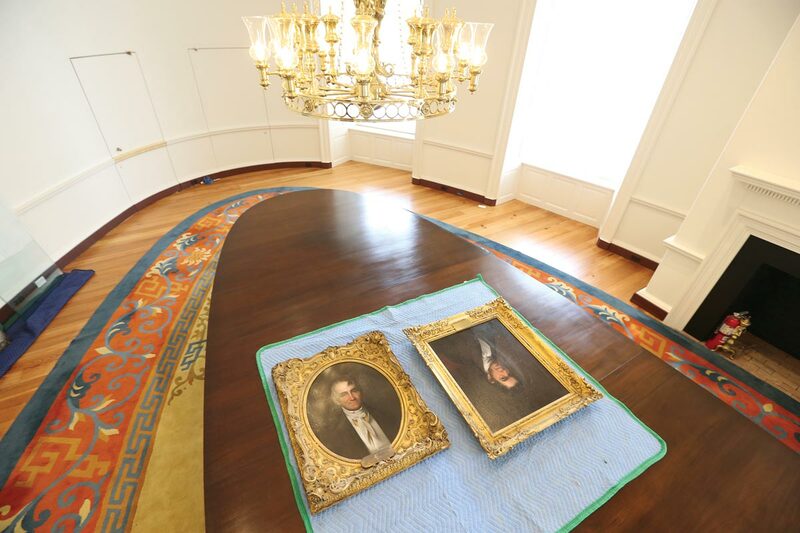 Portaits of Joseph C. Cabell (on table, left) and John Hartwell Cocke (on table, right), who were instrumental in establishing the University, will hang on either side of the Thomas Sully portrait of Jefferson in the Board of Visitors’ meeting chamber in the East Oval Room on the main floor. 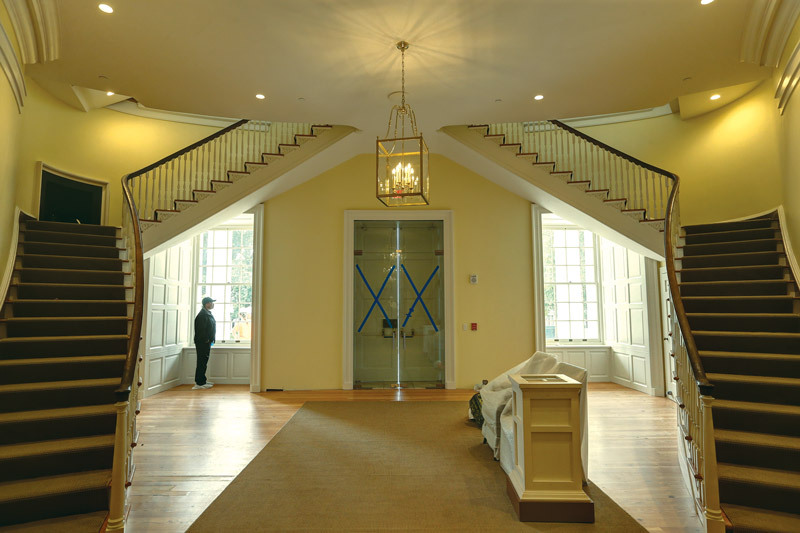 Anyone who attended an event in the Rotunda prerenovation knows how sound traveled up and down the staircases in the building; you couldn’t walk on one floor without hearing (quite clearly) what was going on above or below. Most of that sound will be blocked now, thanks in part to the simple, more straightforward design of the new stairwells that omits the landing space of the previous design. Even if there’s an animated Board of Visitors meeting on this floor, students can still study in a relatively quiet Dome Room upstairs. 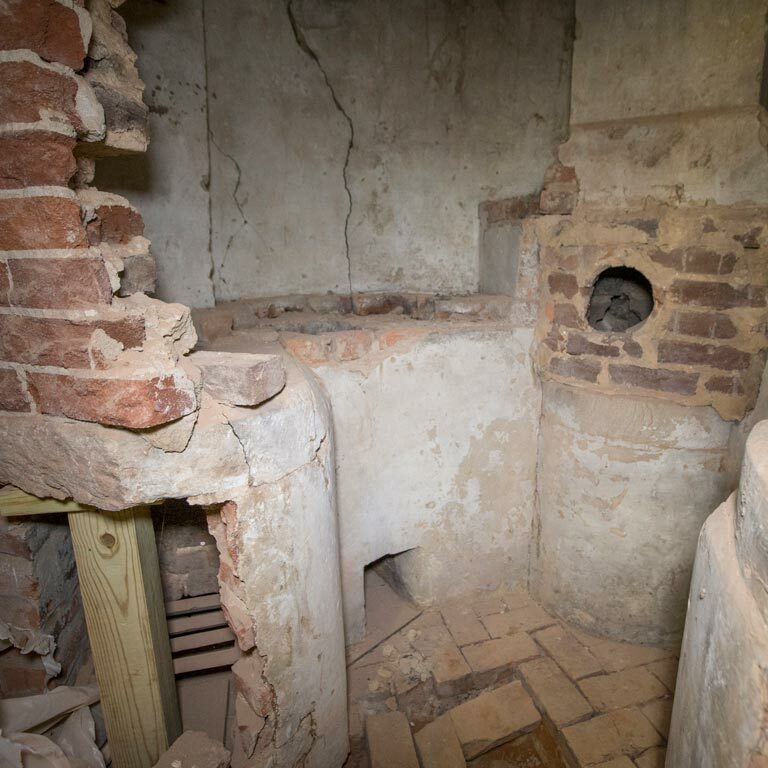 During the restoration, conservators discovered a chemical hearth, part of an early science classroom that had been sealed in the Lower East Oval Room wall since the mid-19th century and was thus protected from the 1895 fire. 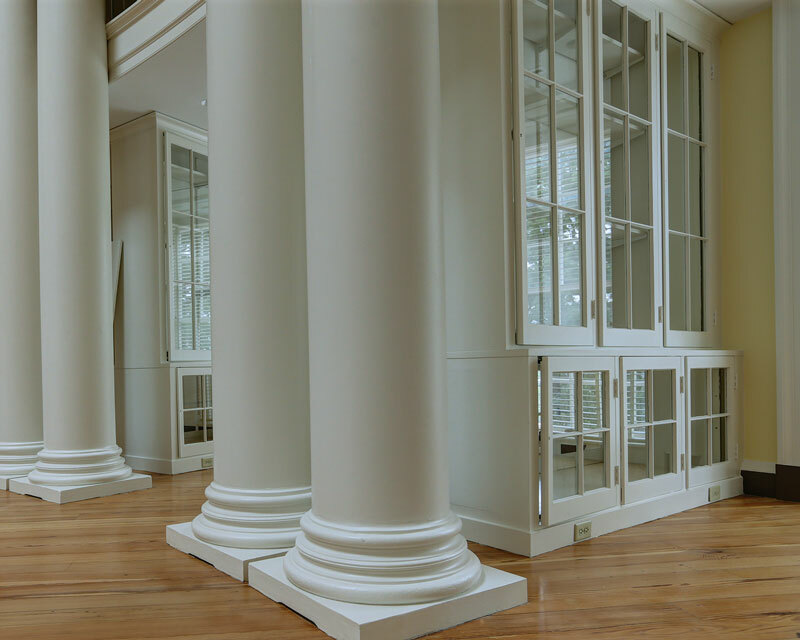 That room—hearth and all—is now a visitor center featuring artifacts of early University life, such as the Rotunda bell and a photograph of bell ringer Henry Martin, and exhibits on topics such as the history of slavery at the University. 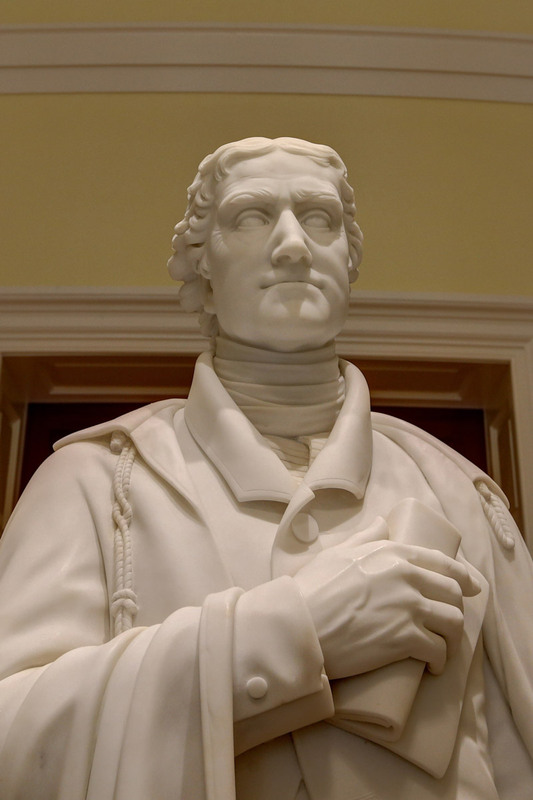 Legend has it that the nicks, dings and scrapes on Alexander Galt’s marble statue of Jefferson happened during the 1895 Rotunda fire, when students rushed to save the statue from the burning building. 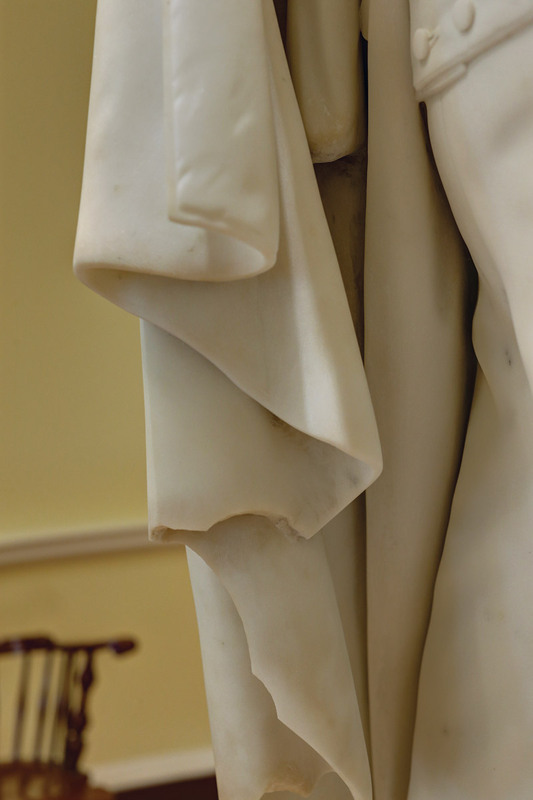 The statue was carefully packaged for its most recent journey out of the Rotunda—it stood in Special Collections during the restoration—and back, says senior historic preservation manager Brian Hogg (Col ’83), who notes that the chips are more visible now that the statue has been cleaned. The Rotunda was built directly on the clay ground, with essentially no foundation. 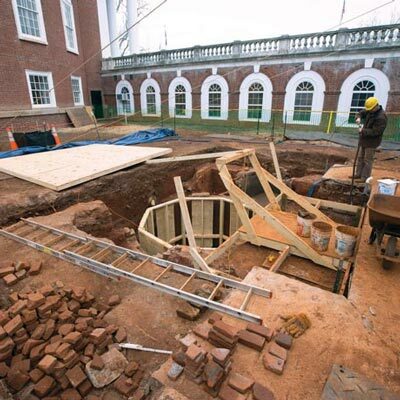 In order to create one, workers dug small pits—about 3 feet by 4 feet—under the building. Once a pit was dug, it was filled with concrete; workers then moved about 10 feet down the line and dug and filled another pit, and so on. 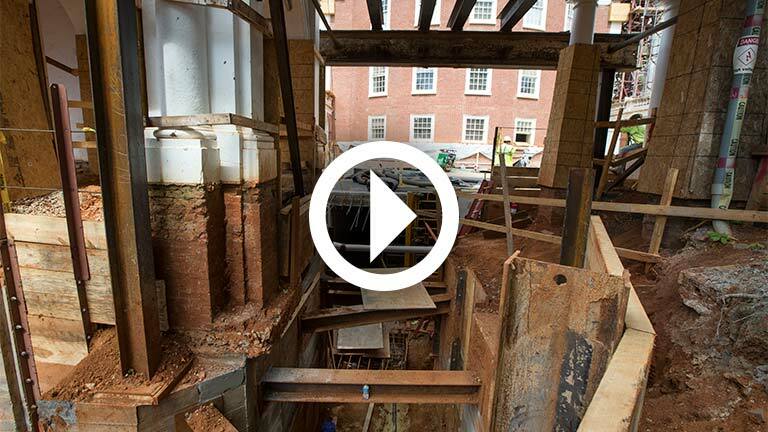 They dug nearly 100 pits—all of them now invisible beneath the courtyard hardscape—to support the building. 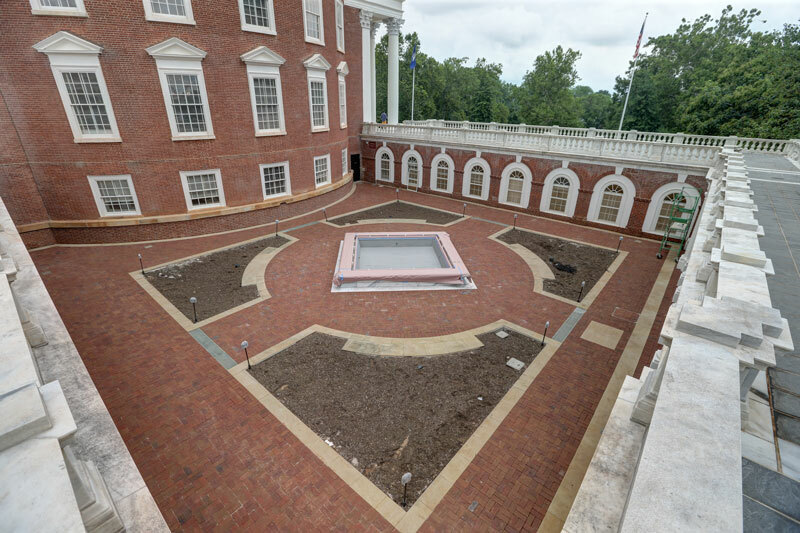 The Rotunda’s west courtyard is an open space with loose tables and chairs, and while no fountain is planned, there’s space to build one later. The east courtyard (pictured above) is intended as a quiet, contemplative space—it gets morning light and afternoon sun—with four curved benches and water tumbling over an invisible-edge marble fountain. Shrubbery and small trees will be planted later this year, says Hogg. 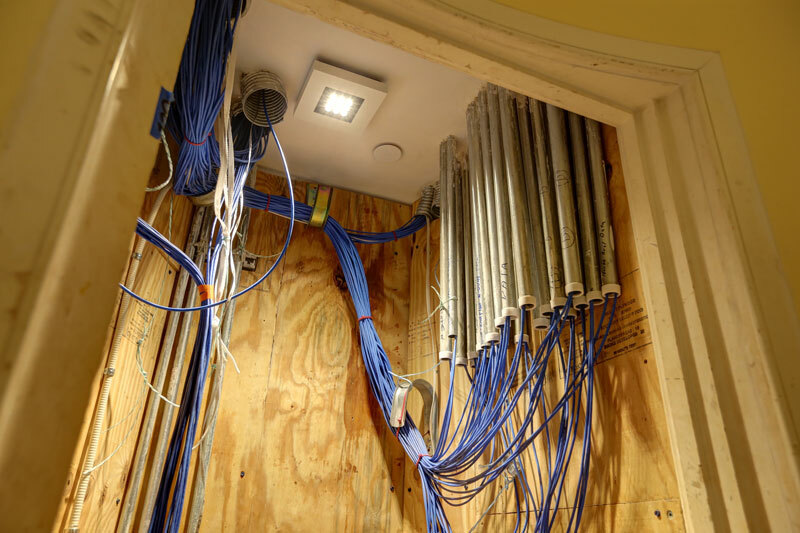 During the planning phase, Hogg says the preservationists asked themselves: “If we want the Rotunda to be busy, what do we need to make it busy, to make it work…in a 21st-century academic setting?” The answer: more power, hard-wired data (the blue cables pictured here), hearing aid technology, better plumbing and more. 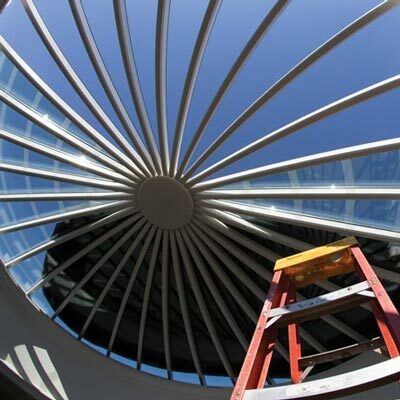 Crews rewired the entire building to LEED standards, tucked their work into the walls and ceilings and effectively blended modern technology with the Rotunda’s traditional appearance. 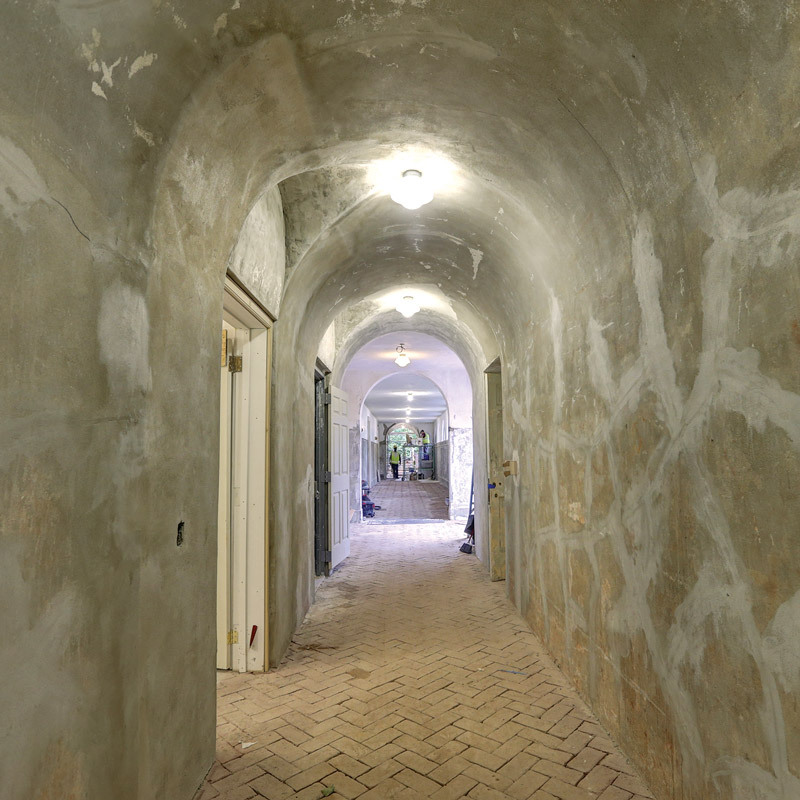 The arched hallway under the south portico stairs sees a lot of foot traffic throughout the school year, and during the restoration, it held construction materials. 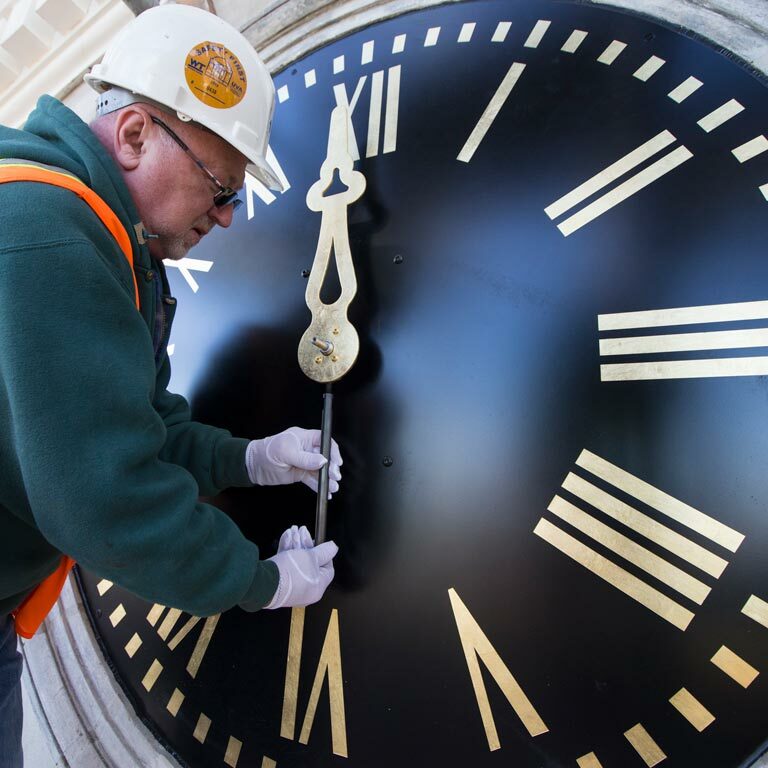 Workers repaired the cracks and gave it a fresh coat of paint. 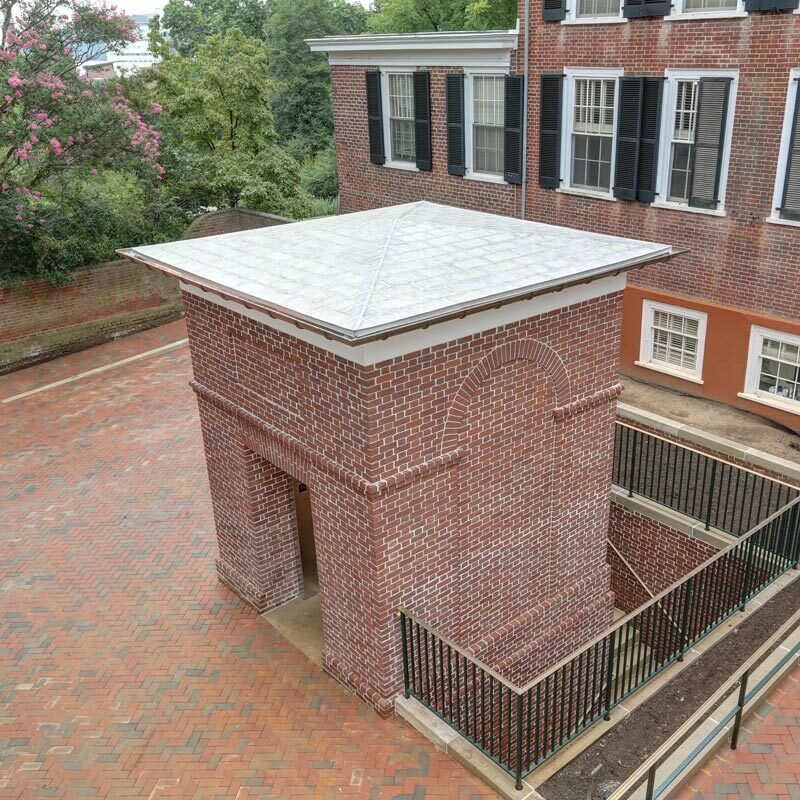 This service elevator in the Rotunda’s east courtyard connects to an underground tunnel that leads to a new kitchen space beneath the Rotunda. It’ll make event catering much easier. 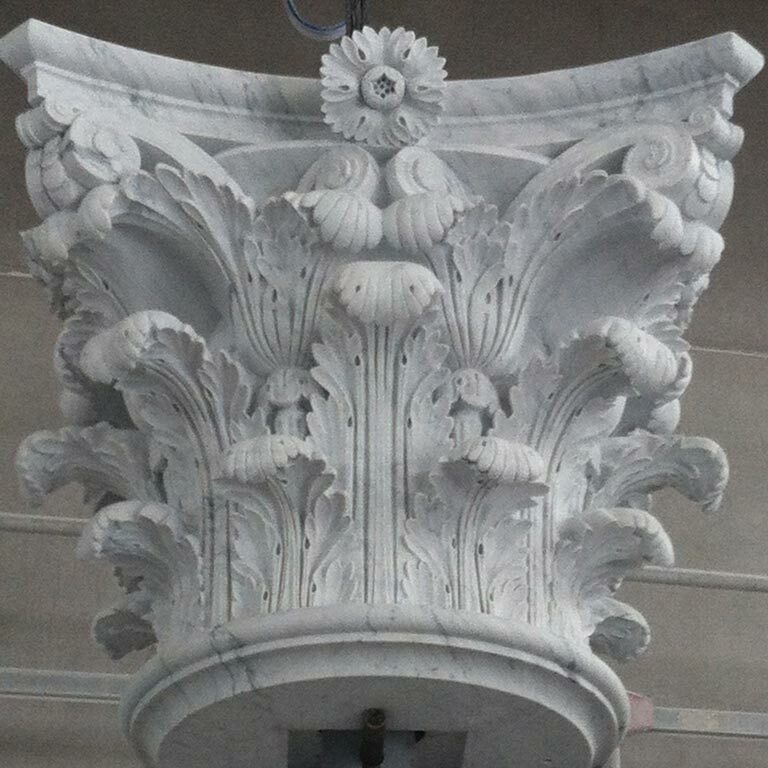 Sixteen new capitals—10 for the south portico and six for the north—were re-created from Jefferson’s specifications by Pedrini Sculpture Studio in Carrara, Italy. 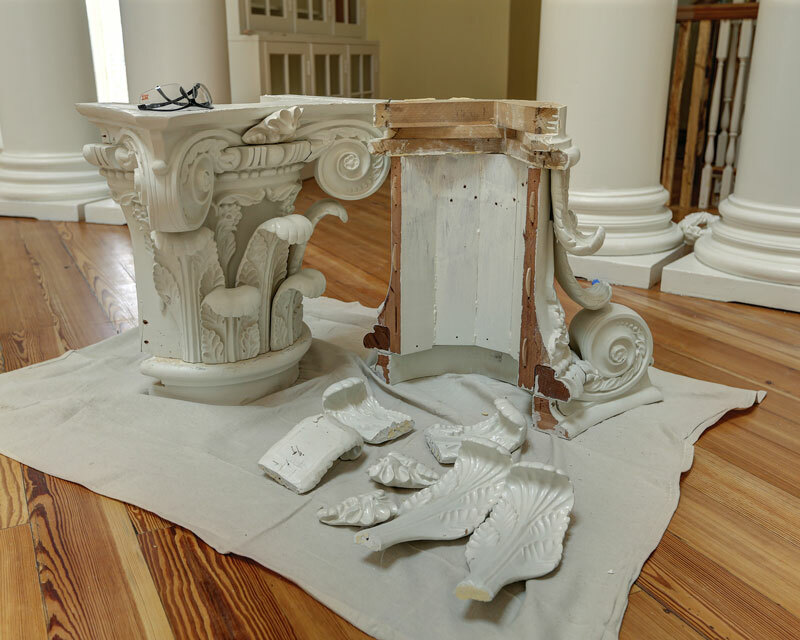 Craftspeople from the studio visited Grounds in fall 2013 to examine the remnants and historical photos of Jefferson’s original Corinthian capitals. They cleaned larger remnants to match marble colors and original carving details, then made laser scans to generate a 3-D model of a historically accurate capital. 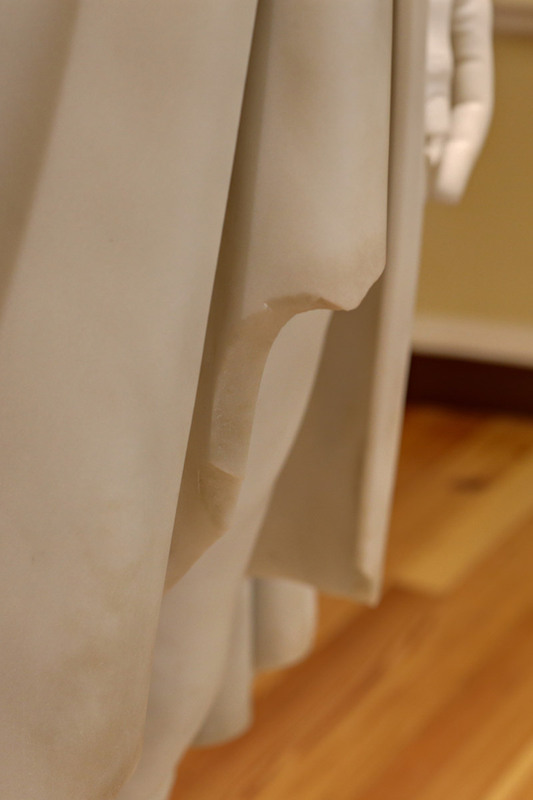 From the digital 3-D model, a computer-controlled lathe carved about 90 percent of each capital from an approximately 4-foot, 9,000-pound cube of Carrara marble. 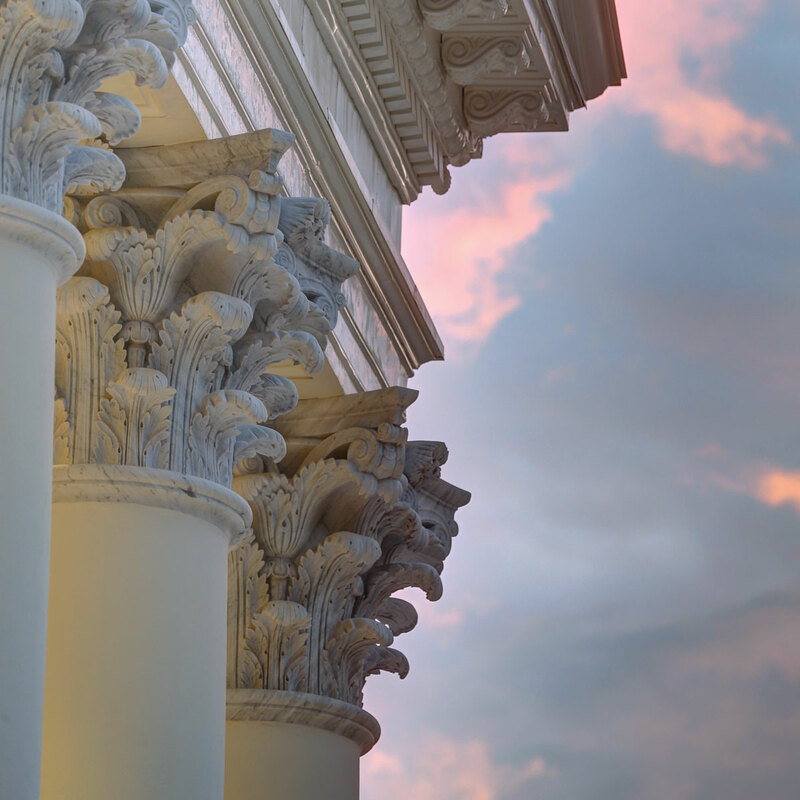 Pedrini’s craftspeople added details and finishing touches by hand before the 3-ton capitals were installed atop 25-foot concrete columns. 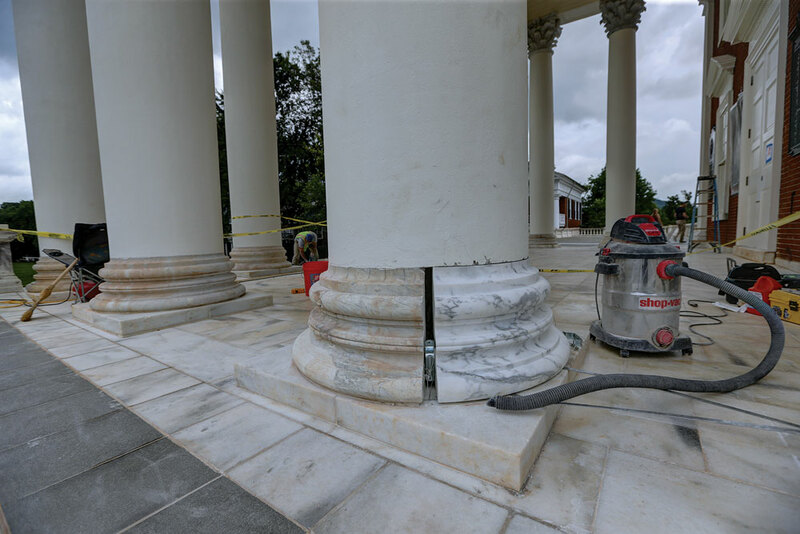 In the final restoration phases, crews worked on replacing the cracked, disintegrated stone at the bases of the Rotunda portico columns. They cut out slivers of the bad stone and patched the gaps with new, harder stone. 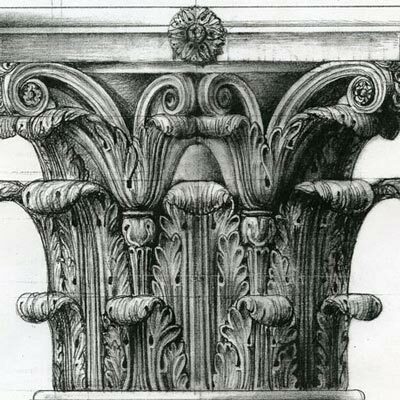 Tektonics Design Group in Richmond designed and carved 40 mahogany capitals for the Dome Room. 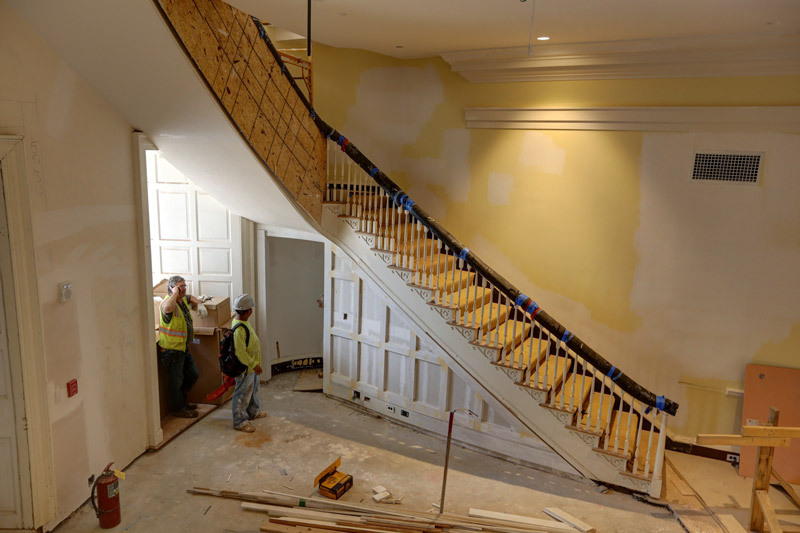 They’re modeled after the room’s original capitals, which were carved from Maine white pine by Philip Sturtevant of Richmond, and are more detailed than the plaster capitals installed during the 1976 renovation. The pine capitals perished in the 1895 fire, so preservationists and artisans looked to pre-fire photos of the Dome Room and other examples of Sturtevant’s work to create a clay model of the original capitals. 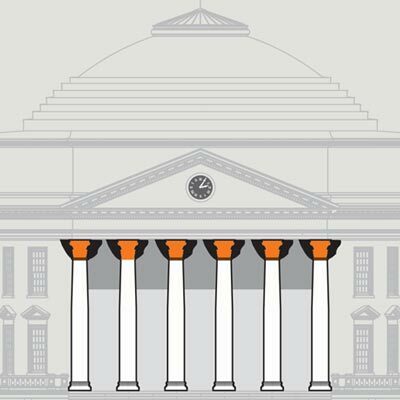 They also referenced letters from 1824 between Sturtevant and Arthur S. Brockenbrough, supervisor of University construction, which include details on Jefferson’s specifications for the capitals. 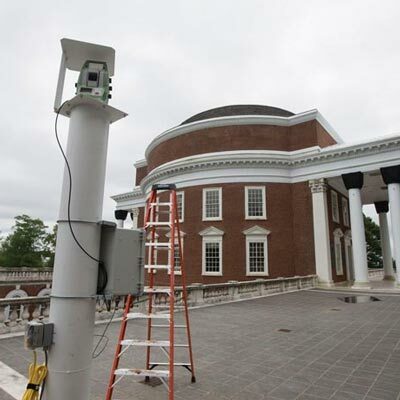 New books, plus books about the University and books written by UVA alumni and faculty will fill the Dome Room bookcases, and students will be encouraged to use them. “How cool, to be able to take a book [from the case] and read it in what was the library so many years ago,” Hogg says. The Rare Book School will curate special exhibits for the cases as well. To make a new, smoother Dome Room ceiling, workers cut rectangular pieces of porous backing board to fit around its curved surface. 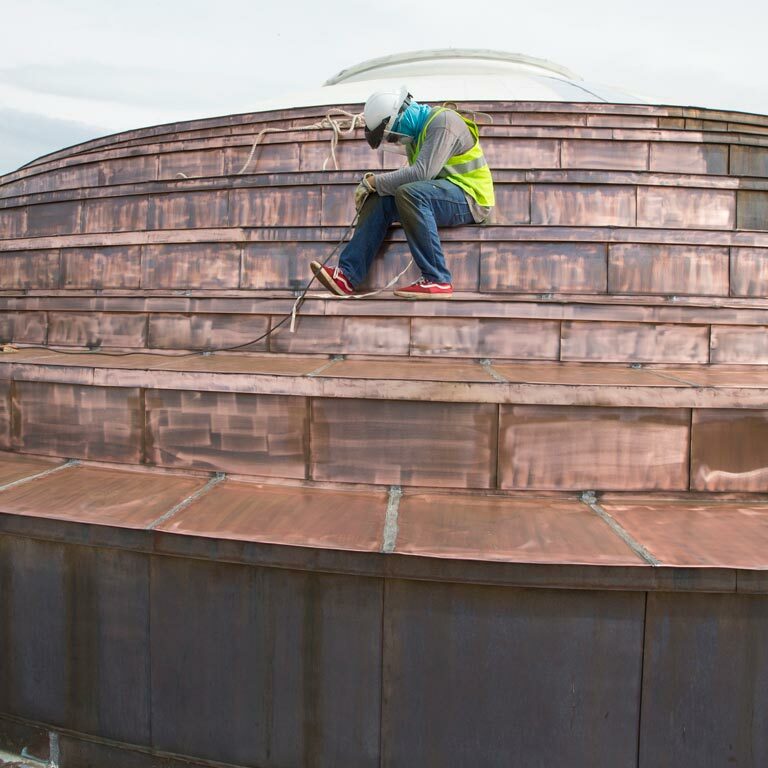 Metal channels hold the backer board a few inches off the terra-cotta tile dome, giving some air space between the plaster and the structural dome. Workers painstakingly applied perforated acoustical plaster to the backer board and covered the plaster with a very thin finish to achieve a smooth, rounded look. The plaster will help manage noise in the room, but it won’t reduce all of the echoes; the Whispering Gallery still works. 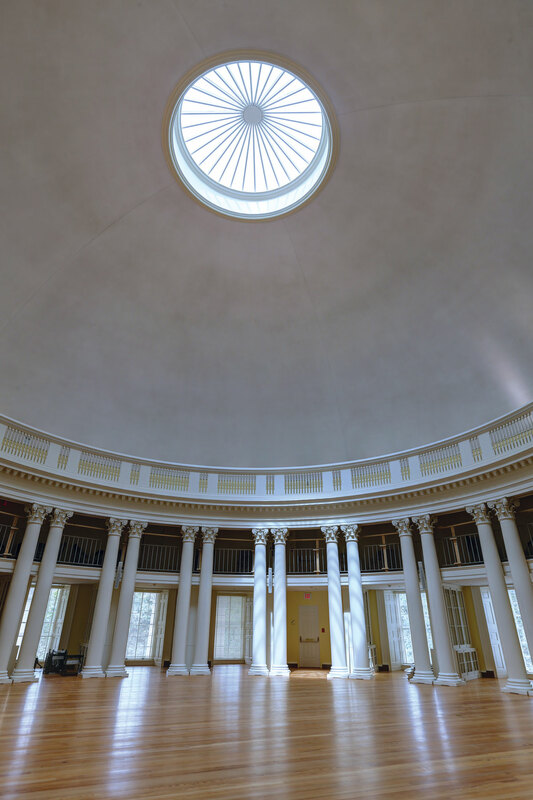 Visit Alumni Hall and see our new gallery exhibit showing the engineering and craftsmanship behind the four-year effort to restore the Rotunda. 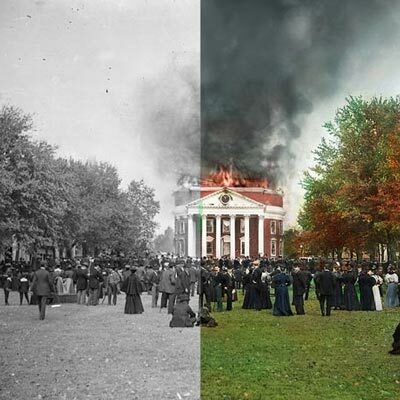 See the Rotunda fire like you’ve never seen it before. 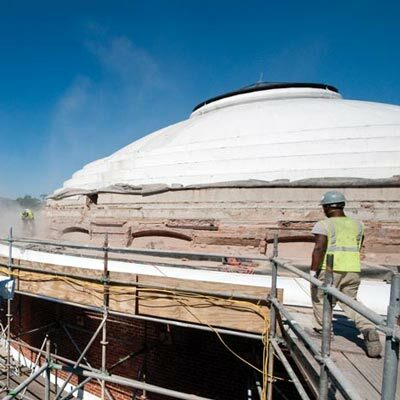 A major Rotunda renovation is underway. Like the changing architecture of the Rotunda itself, the debris from previous renovations tells a story.